Note: Newsletter sent on 24th of September 2015 to my subscribers. If you would like to receive such newsletters please subscribe at the bottom of this page. Today is 24th of September 2015. It is expiry day for all derivative trades done for the September 2015 expiry. This email is a reminder that please DO NOT forget to close all Futures & Options contracts that will expire today by 3.15 pm. Out of the money options that are sure to expire worthless need not be closed as they are worthless. But all Futures contracts and In The Money Options (ITM) needs to be closed. If you will not do it then your broker will close it anyway at market price, so its better that you close it and get the best possible price. If you do not close and your broker also does not close then the exchanges will close them at closing prices and they may fine the traders. On top of that you will know the rates only when the contract note is sent to you. This situation must be avoided. To avoid this kind of uncomfortable situation its always better that you close the trade yourself or ask your broker to close it and confirm that its closed before market closes for trading that day. Though I asked to book profits in the put credit spread advised on September 10, 2015 as these are uncertain times because the China issue is still lingering, I am sure some people did not. Well that put credit spread will expire worthless today giving a return of 3.7% (37 points) in 14 days. Those who closed earlier don’t feel bad, we made a profit that is it. Markets will give us another opportunity. 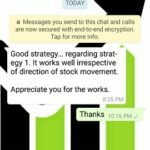 Yesterday someone called me and said that the free trades that I recommend through newsletters make more than 3% a month, so why would someone buy my course that only promises 3% a month? My response was – what if I stopped giving free advice? Do you want to depend on my free tips for your whole life? Do you really want to trade like this? The whole idea of this website and my course is that you DO NOT become a puppet in the hands of anyone including me. Its your money – learn to manage it yourself. Learn to trade yourself. Name a single person on this Earth in history who has made a lot of money with the help of tip providers. You cannot name anyone, because they do not exist. When history is proof, why you want to believe that you are the person who will change history and become rich by tips providers? There are thousands of tips providers out there and I bet you will keep changing them every month in the hope you get to the best one soon. I get many calls and almost all of them are still searching for that one good tip provider. Some are searching since the last 15 years. Not to mention the money lost. If you go with them, you lose money from two fronts – one by paying them – other by trading their tips. And the worst part is you also waste your precious time. If you do not want to take my course. I am OK. But please do some good course somewhere or invest your money in books. Do not waste them on tips providers. Basically invest your money in seeking knowledge, not on taking blind orders from someone you do not know. I know taking orders is easy, but learning is not. But which easy path has ever made money? If you think you want to know more about my course then contact me. I read and reply every email. Many Thanks for being my subscriber. 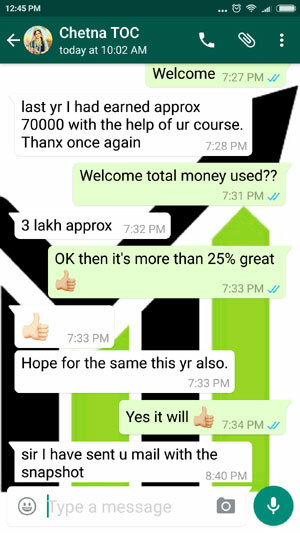 Here is what traders have to tell about my course. You can pay online here and start learning today. Everyday I wait to read your emails. Thanking you for providing such useful information as I have not known such a thing that In the money options need to be closed before expiry else fine may be imposed. Once again thanking you for such a important information. Glad that it helped you Krishna. 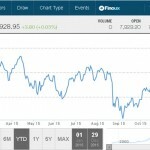 A question: Why does the stock exchange impose penalty on ITM & futures trades.. & how much.. Frankly my broker told me this that if you do not close exchanges may impose penalty. However its better to be safe than sorry. Therefore I emailed everyone. Just to know whether they impose penalty or not its not a good idea to leave the trades open. In fact I close even those options which expire worthless at around .10 – there is no point in taking risk of leaving it open. In any case if you do not close, your broker will close all your trades. Now coming to your question. In the money options needs to be closed because they have a delta of 1. 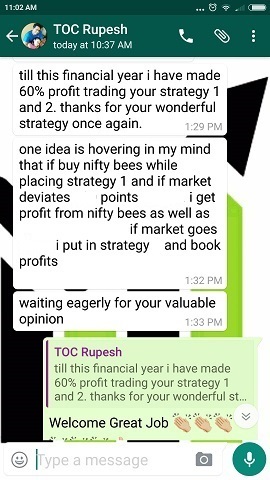 Now assuming you bought 40 lots option (1000 shares of Nifty at 25 per lot) for 110 with 100 as intrinsic value and 10 as time value. Assuming on expiry day its in the money by 200 points and you forgot to close. Depending on Nifty level, even slight movement will bring huge fluctuations to the profits of the trade. 1 point up you make Rs. 1000 more profit, 1 point down profits go down by 1000 rupees. Once the markets are closed for trading exchanges will settle all options and futures at a rate which you will never know until the contract note is sent to you. Both exchanges and the traders like to avoid this situation. Some traders may not be happy with the closing rate they got. Exchanges do not want such troubles – so they inform their brokers to make sure they close all in the money trades before 3.25 pm. 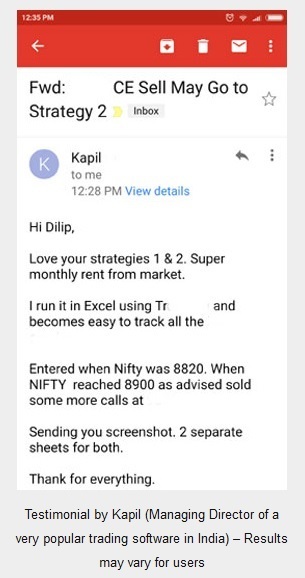 Hope its clear now why you should close all ITM trades on expiry day. I have plans to subscribe your course sooner !! Its a matter of time . then how many lots(1 or 2) will you trade to form spreads . so as per 3% will it be on 60000 or 100000? 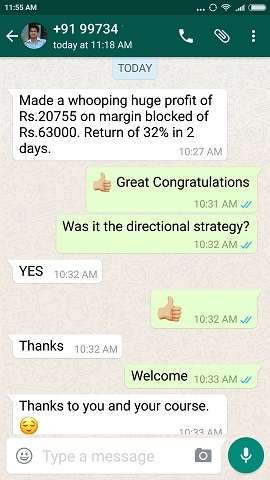 3% on margin blocked for the trade. I am PREMANANDH ,and I am an agriculturist . I am waiting for my Harvest season to come to an end. Certainly I am very much fond of Technical Analysis. I had planned to go through your course. We will soon get connected through your course. Till then bye.